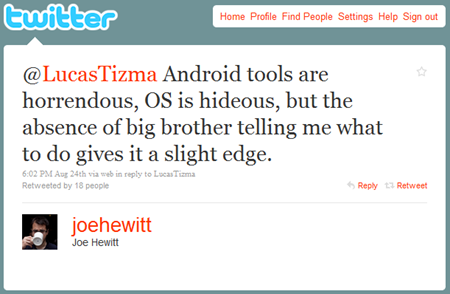 Joe Hewitt, the man behind Facebook Mobile for both the iPhone and Android, hates Android. And the iPhone. And judging by his twitter feed, he also hates people, kittens, unicorns, and the Salvation Army. Just kidding - but as Chris says, he's definitely a "negative nancy." (Yea, we're going for the high-brow stuff today). Ouch. 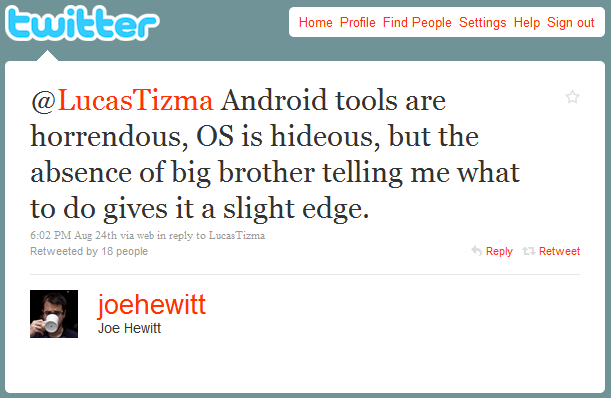 This is the same guy who left Facebook's iPhone dev team because of Apple's tyranny. I'm not a programmer, but I can't imagine any system is perfect to code for, and frankly I haven't heard any other devs complain about coding for Android. That's an unedited snapshot of his twitter feed. What a charmer. Still, if things are that bad, maybe he could switch to the Blackberry or Symbian team, and code for a sinking ship. Just kidding - after all, who am I to judge, especially somebody who can do something that I can't (I mean it). What do you think, devs? 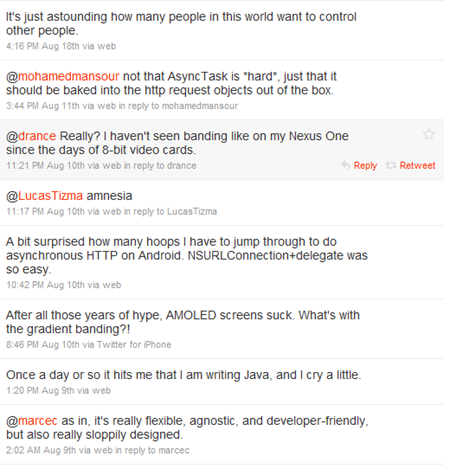 Is Android a nightmare to code for? Drop us a line in the comments below.